Again, I must reiterate that nothing speaks with more power than the marching of 10,000 women, men, children, and everyone else marching peacefully through the streets to push for change. Perhaps I am partaking in a new era of American progressivism, of this re-awakening of the mass of Americans who realize that not only do things need to start changing in this country, but that it just takes one person to ignite the people to action. 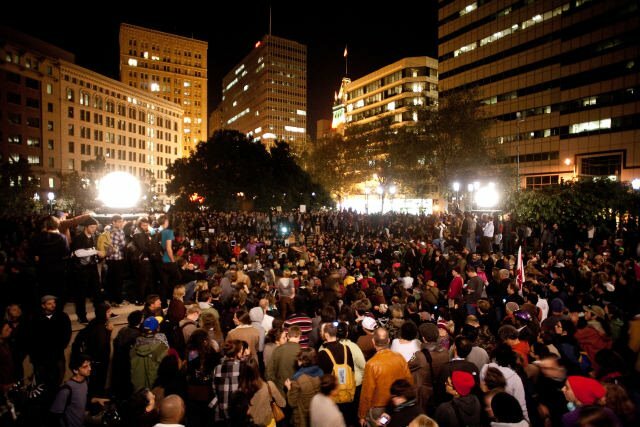 OccupyOakland has reminded me that I am Ghandi, I am Buddha, I am a Rosa Parks, I am Martin Luther King Jr. In my K-12 education, from time to time there was a particular emphasis on certain stories from the movements of the 1960s and 70s. I sincerely believe that we should teach the struggles of the past in order to remind us of how grateful we should be. I also see, however, the idolization and almost more-than-human like persona these people have been portrayed as. We have to remind ourselves that Rosa Parks, Richard Aoki, Cesar Chavez, Martin Luther King Jr., and Malcolm X, and other revered leaders of the time were not superhuman, were not innately special. No, these people were one of us, they were the 99% too. To idolize them in an almost revering manner makes the status of these people seem so unattainable, so out of reach for the “average” protestor. No, all of us are leaders. All of us have the power to make this a better society. OccupyOakland showed America just that: that if the people from one of the most silenced, most heavily-hit cities from the mortgage loan crisis, most heavily underfunded cities in this country can organize at the level and scale that would make the opening day sales of the HP TouchPad cringe in jealousy, then every citizen of this country should be able to do that too. We are all game changers. We are all powerful. In particular now, I want to discuss the city of Oakland, my city and my hometown. I love what I not only saw, but felt yesterday. It was an energy that I have only ever felt in Oakland, that undying passion to not only make the world a better place, but to do it while being cognizant that change should come when everyone does it together. Oakland has been through some tough times, has seen better days, but I truly believe that my city should be hella proud of what just took place yesterday. We showed the world that we still have a strong history of not being silenced by the brutality of the police, that we will not be complacent, and that we are strong in our tenacity to stand up for what we believe is right and just. Though we may not be the traditional tourist destination of the Bay Area, I think anyone seeking to find a city with some of the most down to earth, real, and brilliant people to join should come down to the capital of revolutionaries. Oakland, you politicized me. You gave me the gift of knowing that I have the power to make positive change in the world, to move mountains with my heart, and to above all keep it real with my people. I want you to know that wherever I go in life, even where I am now in college at UC Berkeley, I am trying and will always strive to hold onto all the parts of me that I still call home. I will never forget my hood. I will never forget you. I just wanted you to now that I know what I must do to advance my community, to push for change, and that starts with never forgetting where I came from.